Hba1c 6.4 is it curable? I'm Wendy from the Philippines. I was told by my Doctor that i have Hba1c of 6.4% does it mean that i have a diabetes? She gave me medication and she gave me metformin hydrochloride 500mg. Does it mean that i have diabetes? Can this still be cured? Because she told me that if my Hba1c falls down to normal then i will stop taking medications & i have no diabetes. Is my HBa1c curable? im 33 yrs. old and my dad has diabetes when he was 55. I have to inform you that no one is able to confirm or exclude diabetes as diagnose based only to the result of HbA1c test. Other tests are necessary to be carried out to determine this diagnose. For example, oral glucose tolerance test, fasting blood glucose test and others are needed and you haven’t mentioned if you have run these test or not. 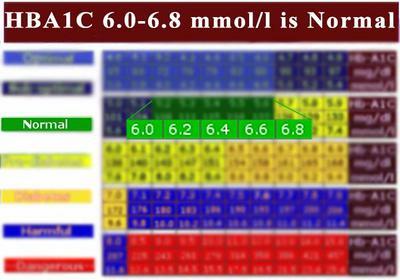 In addition, I will mention that normal ranges of HbA1c result is less than 6.5% and your result is 6.4. This means that you have normal amount of glycated hemoglobin in your organism. 2. Second thing is that metformin is really an effective drug and it is used on patients with confirmed diabetes and not on those, who have elevated HbA1c result. Other thing is that patients, who were recently diagnosed with diabetes, are trying to keep their blood glucose concentration within the normal ranges by diet and exercises. If these manners are not effective, drug treatment starts and in most cases metformin is the drug of choice, commonly used. However, my advice for you is to start following a healthy diabetic diet and begin to do some exercises. Your diet has to be composed of meals, which are containing small amount of sugar. Try to concentrate on fruits and vegetables, because they contain small amount of glucose. I’m not telling you to eat only fruits and vegetables, but to eat more of them. Besides this, it would be better for you to make yourself a regime of 4-5 feedings per day, with which you will ensure your organism continuous intake of nutrients. Regarding the sports, running for about 1 hour a day will help you to reduce the amount of glucose in your blood. This will lead to lower result of the HbA1c test and low blood glucose concentration respectively. Other thing, which you can try, is to start using herbs, like gymnema sylvestre and bitter melon. They are really effective on patients with blood glucose problem, like you. I know that they can be found in the Philippines as fruits too. So, try to include them in your daily menu. 3. It is true that sometimes, diabetes have genetic predisposition, but it is not always inherited from someone- father or mother. You have to know, that other factors like chronic stress for example, are leading to diabetes.